Playing 007 is both a curse and a blessing because any actor who has played Bond will always be best remembered for that role regardless of whatever other films they make, no matter how good they may be. Take Sean Connery who in my book was the best Bond and has made some bloody brilliant films and is one of my favourite actors. He is a legend, make no mistake, but with the six Bond films he made, he tried his best to shake off the character with other films that were not as successful until probably the late 80's to early 90's which is when I think he made the best of his non Bond films. George Lazenby hasn't done a great deal acting wise post-Bond but he seems to be happy enough with his one performance as Bond and doesn't mind being associated with it . Roger Moore, another legend and national treasure, seems more relaxed about the whole Bond thing and still enjoys being associated with the character. Timothy Dalton has done some great films post Bond (Hot Fuzz , Toy Story 3) and he too seems to enjoy being remembered for being Bond. Daniel Craig seems to be doing very well with making a clear line in the sand when it comes to his more serious Bond and making other films like the very enjoyable Cowboys And Aliens, Defiance,The Golden Compass ,Flashbacks Of a Fool and The Girl With The Dragon Tattoo , aswell as the forthcoming NASCAR movie Logan Lucky and TV series Purity. Now, we have Pierce Brosnan who was also brilliant as 007 but he has stated in recent interviews that he wanted to play Bond more realistically and he was not 100% happy with his efforts. He shouldn't be so hard on himself because there was nothing wrong with his Bond movies ( apart from Die Another Day). Granted, he didn't have the best scripts to work with but you can't really blame him for that . However, I do admire his honesty and the fact he remains humble about having had one of the best jobs in the world. This brings me onto The November Man which is a real jewel of an espionage action thriller. 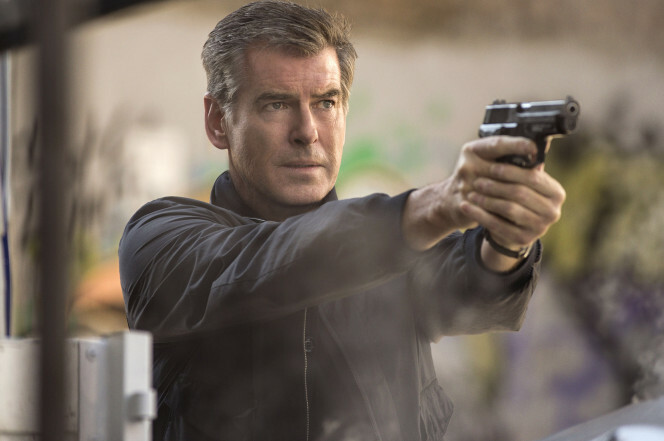 Brosnan plays a retired CIA agent Peter Devereaux (code name The November Man) who is lured out of retirement for that "one last job". The job: to protect a witness targeted for assassination who is played by ex Bond girl Olga Kurylenko. Then we have an ex student agent of Devereaux who has a personal score to settle after being dropped from the CIA training program by Deveraux. There are lots of clever twists and turns in the film so I won't go and give it all away but rest assured you will love this film if you are into fast paced no nonsense action. Brosnan plays his role very well indeed, showing us how he wanted to play Bond in the first place and then some ,one scene where Deveraux puts a knife to a girls throat and then severs an artery is something you wouldn't see even in a Timothy Dalton Bond film. Deveraux is angry and brutal throughout and Brosnan clearly enjoyed being able to do something different . Sadly The November Man got a shockingly bad release in Britain but it is on Netflix ,Itunes and Amazon Video . But if you want it on DVD or Blu Ray you'll have to import it, the one i bought came from Poland. Lets hope that for the sequel Brosnan's production company chooses a better distributor. I Have to say though that i thoroughly enjoyed The November Man and if you want a taste of what Brosnan's 5th Bond film could have been like it's worth a look.